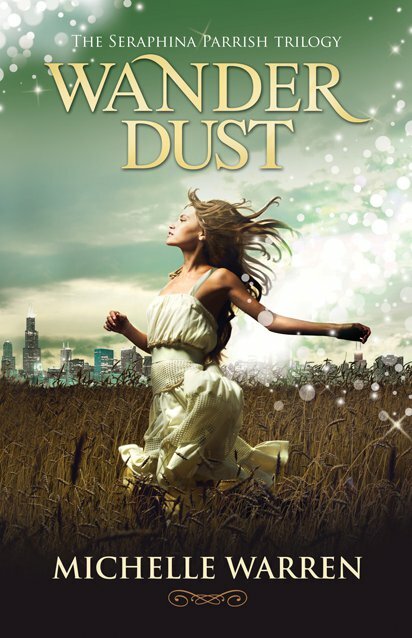 I love pretty much everything about this cover - the colours, the girl's dress, the sparkly bubbly things, the font of the title, the fact that she's running through a field, the cityscape in the background, the swirly thing under the author's name - all of it. I first saw this cover as an ad on The Story Siren's site and the cover and title immediately caught my eye. I can't wait to read this book. Synopsis: Ever since her sixteenth birthday, strange things keep happening to Seraphina Parrish. But when Sera moves to Chicago and her aunt reveals their family connection to a centuries old, secret society, she is immediately thrust into an unbelievable fantasy world, leading her on a quest to unravel the mysteries that plague her. In the end, their meanings crash into an epic struggle of loyalty and betrayal, and she’ll be forced to choose between the boy who has stolen her heart and the thing she desires most. 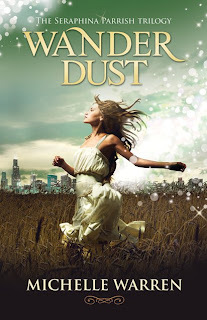 Wander Dust is the breathtaking fantasy that will catapult you through a story of time and love. I loved the bubbles on the cornes, they bring fun thoughts to the cover. The bubbles are awesome. They also kinda look like those white puffy things that float off of dandelions. Enter my 1 Year Blogoversary Giveaway! I agree, that cover is just lovely!